work fluidly is writing on the Svbtle network. We just released an updated announcement modal. 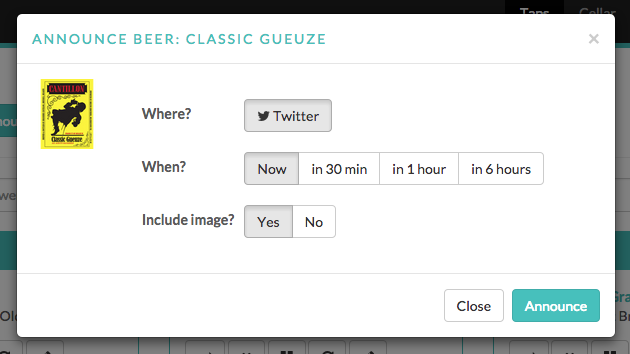 Rather than offering you a second modal to tweet your beer, we added a check box to the load beer modal so you announce your beer in one feel swoop. If you decide to tweet, check the box and you’ll see an option list with a couple tweet text options. Down the road we’re going to give new and secure control over the text of these messages, as well as the opportunity to load a post on your business’ facebook page. Stay tuned and tweet on. This summer we launched fluidly communities: the heart of consumers’ fluidly experience. 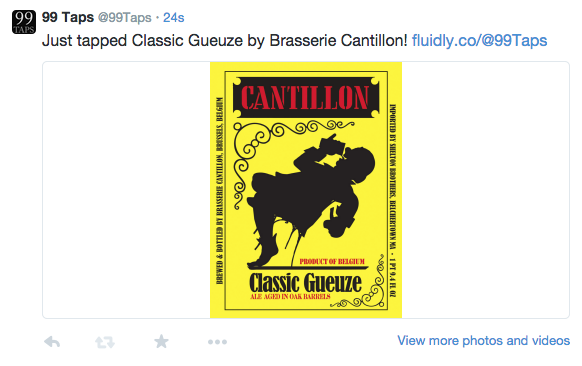 Fluidly is a symbiotic marriage between beer businesses and beer enthusiasts. Over this year we’ve explored several communities to the market needs and opportunities for this software. The industry standard is helping businesses market their beer. We’ve observed two differences. Either the community is large and competitive enough that businesses understand and use the free solution or the community uses mixed solutions because some businesses get locked into expensive one year contracts. We also observed that smaller communities tend not keep their taps as current as the larger and more competitive markets. The one exception being the businesses locked into one year contracts, that feel compelled to keep up with the list because of the money they’ve dropped into the software. The key opportunity we see is data and insight. It drives me crazy to see how much data businesses have and they either stash it from view or don’t know how to use it. Hours of operation is one of these key pieces of data. Leveraging this data help businesses understand their customers better (through more precise reports) and market more effectively. We dedicated a considerable amount of time to it because it will be the backbone of our forthcoming data reporting tools. Down the road, we’re going to use this information to give you a precise understanding of what barrels were the least and most popular. Instead of roughly reporting the number of days a beer was on, we will factor in barrel size and hours of operation. A core principle behind fluidly is working fluidly – helping you reduce double work. 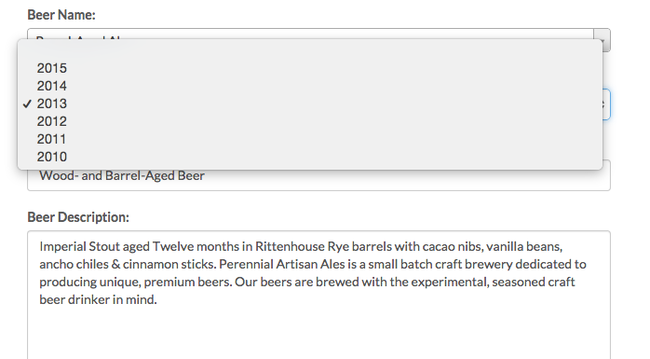 You can now add your real time beer lists to your website – taps, cellar, or both. To do so go to the Account menu at the top right and select Settings. Then select Export code tab on the left, and you will find three HTML Iframe code snippets. Just copy and paste the code for your preferred beer list into a blank page. You may want to alter the height of the Iframe so avoid scrolling. These fields are optional, however once input for a beer, they will be stored in your library. This data will auto populate from your library the next time you load that beer. If you update this information, you will then see the updated information the next time your team loads that beer. Earlier today I sat at one of my favorite bars, drinking one of my favorite beers. They have an incredible beer menu: beautiful, informative, and stocked with amazing beers…however, the beer I ordered wasn’t on the menu. What did it cost? It was “off menu,” but not really. Today they had a hybrid menu. It was their paper menu plus the tweet announcing the limited release. We’re releasing some @SideProjectBrew Fuzzy bottles for on-site consumption today! 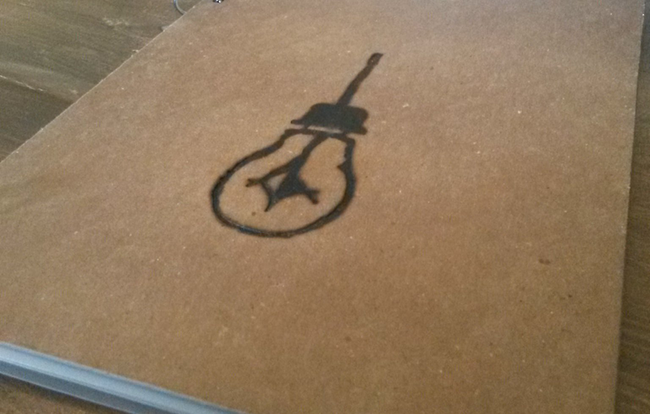 Available when we open at 3pm. Two and a half hours after opening their doors, Side Project Cellar sold out of a couple cases of Fuzzy. No need to print a dozen new pages and reload them into the menus. It was a limited release for their die hard fans (myself included). 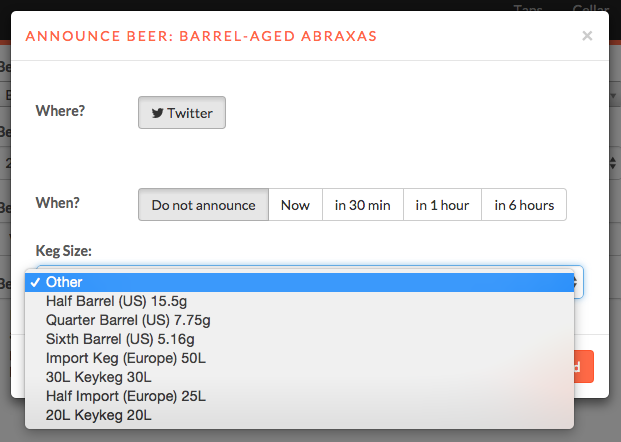 Last Friday we launched our new keg size feature: a critical part of any proper, data driven beer management system. Whenever you load a new keg, you’re prompted to select the keg size. We recommend that you start using this feature immediately and consistently. We’re already working on reports that depend on this data to give you precise insights into the popularity of your kegs. Beer vintages matter. Not every beer can be cellared, but knowledgable beer businesses and drinkers know to look for cellared high gravity stouts, sours, barleywines, barrel aged liquid delicacies, to list a few. Last week fluidly launched vintages. When businesses add a beer to their tap list or cellar list, they’re allowed to select the year. While this feature is clearly relevant whenever you offer flights or special cellared beers, our focus is on better data. We suggest flagging the year on every beer. Knowing that in 2012 you tapped the 2012 Sierra Nevada Bigfoot Barleywine three times, the 2011 once, and the 2010 twice, fluidy’s memory may help you decide how many to buy each year, how many to hold and how long to hold them. Over the weekend we released our latest feature: naming taps. Just mouse over the tap name and you’ll be allowed to rename it. While it may seem simple, it’s really important. fluidly was designed to help you do the hard stuff – the memory, the marketing, and most importantly, the analytics. Our simple interface allows you to do this all with a few clicks, thereby saving you time and paperwork you may never compile, let alone analyze. Your taps should represent your physical workspace. It’s becoming uncommon to find businesses with more than a dozen taps organized in a single, clean row. Some taps may be against the far wall. Another set in the bar…and then you have your casks. We’re happy to announce a new feature: easy image embedding. the image is large enough to tweet, we’ll give you the option to embed it in your tweet. Which results in posts more likely to stimulate your adoring fans. We’re going to get back to work.